"Veni, vidi, vici. "Translation "I came, I saw, I conquered." "Great men are not peacemakers. Great men are conquerors!" — Mirror Archer, Star Trek: Enterprise, "In A Mirror, Darkly"
Throughout history, there have been a few individuals who have had a marked personal effect on the course of events around them. Some did this through political or sometimes aesthetic means, but most of those who were single-handedly instrumental in deciding the path of history have been military leaders. It seems that certain men combine a rare set of natural traits - leadership ability, tactical thinking, staggering ambition, copious ego, and a large dose of suicidal bravery, all combined with a visionary drive to rule the world and the imagination to see it done - to create a whole individual who is patently capable of turning even a ragtag band of woefully underfed and poorly equipped vagabonds into a fighting force that is not only formidable but easily capable of crushing any opposition that stands before it. A true Conqueror strives to claim the whole of the known world through military means, and often succeeds. (Note that he often doesn't put much thought into running it once he's taken it; he just wants the bragging rights). This is in contrast to those characters who rise to universal power through other means (such as subverting the democratic process or literally being appointed dictator by a legislative body). The easiest way to recognize this character is by what he manages to accomplish. If he doesn't take over two or three countries (at least) in the course of the story, he's not The Conqueror. Most Conquerors are by nature Magnificent Bastards. Some even dip into Omnicidal Maniac territory. They are also their own Trope Namers. Quite often, these characters appear in the Backstory of a setting, and all that is left of their conquests is a Vestigial Empire. Conqueror from the Future: When the Conqueror in question is a person from the future who has, in fact, actually managed to conquer something in their time period of origin. Galactic Conqueror: When the Conqueror's ambition is galactic or even universal in scale. Multiversal Conqueror: When the Conqueror desires to take over all of The Multiverse, rather than just one or a handful of universes. The Logical Extreme of this trope. Young Conqueror: When the Conqueror is still in his early adulthood or even adolescence at the time of his conquering. These fellows often get "The Conqueror" as a sobriquet—frequently one of many. Lelouch of Code Geass tried and aimed for this. He didn't particularly need to be in control, of course. By the Grand Finale, Lelouch conquers the ENTIRE PLANET by taking control of a near-indestructible flying fortress that fires super nukes, now manned by elite scientists that are mind controlled to be absolutely loyal to him. YAY. Then he dies, but intentionally, and gives the empire to his little sister, so that's a happy end for everyone else. Reign: The Conqueror has Alexander the Great as the main character. Rider in Fate/Zero is none other than Alexander the Great and is known by the additional title King of Conquerors. Marvel Comics has Kang the Conqueror, Rama Tut, the Scarlet Centurion and Immortus. The catch is that these are all actually the same guy: He's traveled through time so often, and created so many Alternate Timelines, that there is now an entire Legion of Doom called the Council of Kangs made up entirely of his own iterations. Immortus, it seems, is the original Kang, who is now a Boxed Crook: forced to spend eternity undoing the Continuity Snarl that is the Marvel universe thanks largely to him. The Conqueror was a 1956 Biopic about the life of Genghis Khan, who by his death had taken over a whacking big chunk of Central Asia. Nowadays it's best remembered for inexplicably casting John Wayne as Genghis Khan. On the Discworld, the very word "tactics" is derived from a famous Morporkian leader of antiquity, General Tacticus. He more or less wrote the Disc's book on military strategy, helped Ankh-Morpork forge a mighty empire, and when given command of a satellite city-state, promptly made the most rational choice in its self-interest and declared war on Ankh-Morpork (and won, of course). This is only partly why he isn't much liked by Ankh-Morpork's modern leaders - Tacticus was a Combat Pragmatist who tended to minimize his own side's casualties, something the likes of Lord Rust consider cheating. Artur "Hawkwing" Paendrag of The Wheel of Time not only managed to take over the entire continent, but also ran it so well that "a child could carry a bag of gold from one coast to the other without fear", although his justice system became a bit draconian in later years. The only group he failed to conquer were the Aes Sedai, and possibly only because he died before his war against them was concluded. Unfortunately, he succumbed to Vetinari Job Security, and his hard-won Empire collapsed soon after he died. The Malloreon had Emperor Korzeth, who managed to unite his continent after their patron god and king, Torak, was felled (but not killed) in battle, spending his entire life in a series of bloody wars so that he could pass the empire on to his descendants. His ultimate descendant, Zakath, had aims to finish the job and take the whole planet, but his ambitions cooled over time. Part of the irony in Percy Bysshe Shelley's Ozymandias is that the empire of the Great Conqueror Ozymandias is now nothing more than sand and ruins. The message being that all things pass away, even Empires. Aegon the First, also called The Conqueror, in A Song of Ice and Fire, went from ruling a small volcanic island to ruling the better part of a continent in only a few years. Being a Dragon Rider helped. Kieron in Steven Brust's Dragaera. In addition, Sethra the Younger is a wannabe The Conqueror, though she has not succeeded (yet). Robert Asprin's Myth Conceptions introduces Big Julie, the general in charge of one of the largest armies anyone has ever seen. He's conquered a fair bit of the entire world by the time he's stopped by the heroes. Of course, he's a Captain Ersatz of Julius Caesar. In the Back Story to the first Gor book, Marlenus, the Ubar of Ar, has captured the Home Stones of about a hundred other city-states, which in practical terms means those city-states are vassal to Ar. It is Tarl's assignment to steal Ar's Home Stone, thereby breaking their power. In the distant backstory of Deep Secret, there's Koryfos, a pseudo-Alexander the Great who conquered entire universes. By the time of the story, his empire has dwindled and is on the verge of total collapse. Then he comes back at the end to fix it. In The Black Company series, The Lady qualifies as this, having subjugated an entire continent. In the past, her husband The Dominator was even worse. There's a reason Conn Iggulden's novels about Genghis Khan are called Conqueror. Dragonriders of Pern: Lord Fax of The Seven Holds. He was Lord of one hold by birthright, gained another through marriage and just took over the other five through force. By the time we first see him in Dragonflight, it's just in time to see him killed by F'lar. His takeover occurs in the background of the prequel novel, Masterharper of Pern. In the "Armageddon Now" two-parter, Callisto's time travel leads to a changed timeline in which Hercules was never born, and thus never "unchained" Xena's heart. She ended up the cold and ruthless Conqueror. As the name implied, she brought most of Ancient Greece and the Mediterranean region under her boot. Earlier that season, "Stranger In A Strange World" introduced a parallel universe where Hercules is a ruthless conqueror known as the Sovereign. In the Supernatural episode "Devil May Care" (S09, Ep02), Abaddon takes on this role. In the official setting for Champions, there's Istvatha V'han, "The Empress of a Billion Universes", an immortal time-travelling Dimension Lord who really has conquered a billion other dimensions. The oldest from the game's background would of course be the Emperor of Mankind himself. In the 31st Millennium he won the Unification Wars on Terra and led his Great Crusade to conquer the galaxy, with the help of twenty Space Marine legions led by his clone-sons, who in most cases were great conquerors themselves. The problem started with he decided to shift back to an Emperor Scientist, gave command to his favorite son, but remained vague as to what the Space Marines' role would be once the Great Crusade was finished. The result was the Horus Heresy and ten thousand years of grim darkness, until there is only war. During the 41st Millennium, Lord Commander Solar Macharius waged a seven-year crusade that added a thousand worlds to the Imperium, the greatest expansion since the Great Crusade. He only stopped when his troops refused to push into space outside the range of the Astronomican, the psychic lighthouse required for safe Warp travel. Much like Alexander the Great, Macharius died suddenly, and his conquests collapsed into a civil war between his successor generals. A nonhuman example would be Shas'O'Shovah, Fire Commander Farsight or the Rising Empire of the Tau. One of three foremost students of the legendary warmaster, Puretide, Farsight was the first Tau commander to claim major victories against both the Orks and the Imperium; he literally Wrote the Book on both foes, The Book of the Beast and the Mirrorcodex (after the Space Marines' Codex Astartes) respectively. After fending off an Imperial Crusade, Farsight led an assault across the Damocles Gulf to quickly retake several Imperial worlds and push back against the Orks. But in the process his army's Etheral Caste "guides" were slain, and Farsight found... something on the artifact world of Arthas Moloch. The end result was that he took direct control of these "Farsight Enclaves" and declared independence from the Tau Empire, the first of his kind to do so, turning him from one of the Tau's greatest heroes to an almost taboo subject. Most 4X games, by definition, involve the player trying to be this, or at least offer it as an option. Crusader Kings II even has a trigger whereby winning conquests with certain casus belli will give you the sobriquet "[name] the Conqueror". In Everlong, Emperor Daevus hopes to become this. Lord Median the Conqueror from Soul Nomad & the World Eaters united the game's war torn world under his own rule. Walhart of Fire Emblem Awakening may as well be the trope page provider, as he unified the warring states of Valm into a mighty empire through force prior to the events of the game. He now sets his eyes on the neighboring continent of Ylisse. His unique class is even called Conqueror and his special class skill is called "Conquest". No longer unique to Walhart as Chrom himself in Tokyo Mirage Sessions #FE can reclass into this and Alm in Fire Emblem Echoes: Shadows of Valentia can overclass into this. Especially fitting with Alm as the continent Walhart rules with an iron fist is named after Alm: Valm. Most notable is Emperor Tiber Septim (born either Talos Stormcrown in Atmora or Hjalti Early-Beard in High Rock, or possibly both), who became the first person to unite all of Tamriel under his rule (as the Third Cyrodiilic Empire) and after his death became the Ninth Divine, Talos. He did so primarily through, well, conquest, but gained a couple provinces through shrewd diplomacy as well (such as the peaceful vassalization of the Dunmeri (Dark Elven) theocracy, Morrowind). Reman Cyrodiil, founder of the Second Empire, conquered less territory than Septimnote his empire failed to capture Morrowind and only got the Summerset Isles to join via treaty with exceptionally favorable terms to the native Altmer (High Elves) but was no less influential on Tamrielic history and culture. The capital province of the Empire, Cyrodiil, still bears his name (though conflicting sources in-game state that he probably took the name of the country for himself - it was called "Cyrod" by the Abusive Precursor Ayleids). Coronated as a child, Reman quickly proved to be something of a Child Prodigy/Bunny-Ears Lawyer, reuniting the two halves of Cyrodiil (Colovia and Nibenay), and then the other kingdoms of Men (High Rock and Skyrim). He later defeated the Akaviri invasion and absorbed the survivors into his fledgling proto-empire. He would not, however, take the title of Emperor in his lifetime. Uriel Septim V, the 17th Emperor of Tiber's Third Empire, is considered a warrior-emperor second only to Tiber himself in Imperial history. Inheriting an Empire wracked with internal strife and floundering support in the provinces, Uriel V would lead the Third Empire back to greatness by launching a series of invasions outside of Tamriel. Over a span of 13 years, he conquered several island nations in the Padomaic Sea to the east of Tamriel. Then, he invaded Akavir itself. Despite initial successes, he would fail to conquer Akavir as he had hoped, and would fall there in battle himself, making a Heroic Sacrifice to cover the retreat of his legions. Though he was originally a peaceful immigrant from Atmora, the ancient King Ysgramor became one after the Falmer (Skyrim's native Snow Elves) sacked and slaughtered the Atmoran city of Saarthal. Ysgramor returned to Atmora, recruited an army of 500 of Atmora's greatest warriors, and brought them back to Skyrim where he led them on a Roaring Rampage of Revenge against the Falmer. He conquered Skyrim for mankind ever after, and his line would create the first Empire of Men in Tamriel, expanding as far as High Rock and Morrowind at its height. The deceased emperor Verek kel Aldeos desperately wanted to be one of these. After spending nearly his entire reign at war, he still wasn't very close, though. Danny Hebert of Worm unknowingly describes his daughter, who is, unbeknownst to him, a supervillain, as one. More specifically, when asked (by his daughter, out of costume) if it would better to live in a system that worked run by 'evil' or a hellhole policed by the 'good', he likens her actions to that of a feudal lord or emperor, and that that sort of thinking would set humanity back to bronze age mentalities. In Avatar: The Last Airbender, we have Chin the Conqueror. The Avatar-verse's equivalent of Qin Shihuangdi, it took the ruthless Avatar Kyoshi to stop him. Sequel Series The Legend of Korra gives Chin a spiritual successor in Kuvira, Arc Villain of the fourth season. Though her Sobriquet is "the Great Uniter", she's definitely a conqueror (albeit a well-intentioned one), and even outdoes Chin by successfully usurping the Earth Monarchy and making herself Emperor of the new Earth Empire. Ben 10 gives us Vilgax the Conqueror, the Big Bad of the franchise who has conquered 10 worlds and blown up planets. Sargon of Akkad, aka Sargon the Great, more or less invented the concept of empire, and is the first great conqueror we have on record. This Semitic son of a royal gardener launched a coup d'etat in his home city of Akkad and overran every Semitic and Sumerian city-state in Iraq, creating the Akkadian Empire, which endured for 150 years after his death. During his reign (1479 - 1425 BC), Pharaoh Thutmose III conquered Northern Africa and the Middle East from Niy in north Syria to the fourth waterfall of the Nile in Nubia, the largest extent ever covered by the Egyptian empire. Cyrus the Great created the Persian Empire by conquering pretty much every other civilization in Southwest Asia, the Near East, and the Middle East, from Anatolia to the Indus River. Furthermore, he was a savvy statesman able to give his empire a lasting stability by being generous to the conquered peoples, securing their loyalty. Cambyses and Darius, Cyrus's successors, added Egypt, parts of Greece and even more of India to Cyrus's empire. Alexander the Great holds the record for most land personally conquered by a single individual. Qin Shi Huangdi, the conqueror of "all under heaven" (i.e. China). Not only did he conquer, the empire (and the idea) of China that he founded continues to this day as a major world power more than 2,000 years later, unlike most other conquerors' handiwork. Julius Caesar was so effective his name became a title for emperors after him - future Roman rulers were referred to as Caesarsnote Because of family connections at first; it wasn't until after the end of the dynasty that "Caesar" became not a name referring to the current ruler but a formal title., while German and Russian leaders were referred to as Kaisers and Czars/Tsars, respectively. Attila the Hun carved out an empire that stretched from Germany to the Ural River and from the Danube to the Baltic Sea. Charlemagne, King of the Franks and later the original Holy Roman Emperor. Harald Fairhair, first king of Norway. Genghis Khan, who ruled an empire that made Alexander's look like a postage stamp (though he didn't personally conquer all of said land). What's said above under Literature about Artur Hawkwing's realm is actually adapted from a boast Genghis Khan made: "A virgin with a bag of gold around her neck could walk naked from one end of my realm to another without being attacked." Timur-I-Lenk (aka Tamerlane), who claimed descent from Genghis Khan, united both the Chagatai Khantate and the Il-Khanate, as well as various other Central Asian states under one banner - his own. He also earned a reputation for brutality that was pretty much unsurpassed until the modern eras of fascism and communism, building pyramids of skulls from his slain enemies, and massacring entire cities. He was once quoted as saying "As there is only one God in Heaven, there should be only one ruler on Earth." Isabella of Castile and Ferdinand of Aragon united Spain under their joint banners and conquered the last Muslim state in Western Europe. And then they subsidized an ocean voyage by some guy named Christopher Columbus. Modern Spaniards like to give the credit to Ferdinand alone because Isabella was an icon of the Franco regime, but Isabella was a far more capable ruler and a better general to boot; while she was leading troops - often while pregnant - he was off porking his various mistresses before showing up after the battle to take credit. Hernán Cortés and his comparatively small force of Conquistadors toppled the Aztec Empire. Of course, it helps when your opponents have never seen horses, steel weapons or firearms before, have made plenty of enemies to ally with thanks to their practice of human sacrifice, and above all else are dying in droves from the foreign diseases you brought with you. Zahir-ud-din Muhammad Babur, descended from Tamerlane on his father's side, and Genghis Khan on his mother's side, followed in both of their footsteps. Hailing from modern Uzbekistan, he lost his kingdom after a series of setbacks, only to assemble enough followers to invade India. Originally planning only to reclaim some of Tamerlane's old territories, Babur ended up overrunning almost every state on the subcontinent, setting up the Islamic Mughal Empire, which would outlast him by several hundred years. Suleiman the Magnificent: under his rule, the Ottomans controlled everything from Algeria to Iran and from Ethiopia to Hungary. 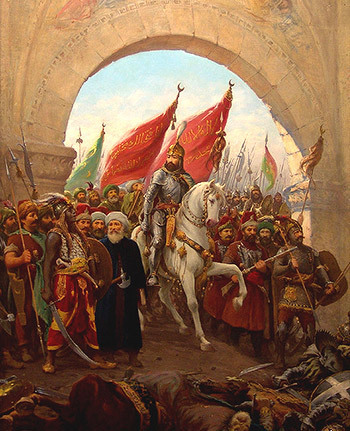 In a bit of a departure from some of the other Conquerors here, Suleiman was also known for the great improvements he made to the administrative system of his country. While in the West he was Suleiman the Magnificent, in the East he was known as Suleiman the Lawgiver. Napoleon Bonaparte, who almost succeeded in uniting Europe under his rule, if it weren't for those pesky British, the Spanish ulcer, and a bad summer and winter in Russia. Adolf Hitler nearly managed to succeed where Napoleon had failed and unite Europe under one banner. He also failed where Napoleon had failed - he never was able to conquer the British, and possibly due to developments in the Balkans, Operation Barbarossa, the Nazi invasion of the Soviet Union, was launched on the same day as Napoleon's invasion of Russia. For extra Tempting Fate points, he planned the later phases of the war from Poltava, where Charles XII's invasion of Russia had failed.